With the end of term rapidly approaching it is appropriate to reflect on our first year-long deployment of the Number.fy app with one of our Year 2 classes. In short, it has been nothing short of astonishing - the best way to demonstrate this is to look at the three graphs below. 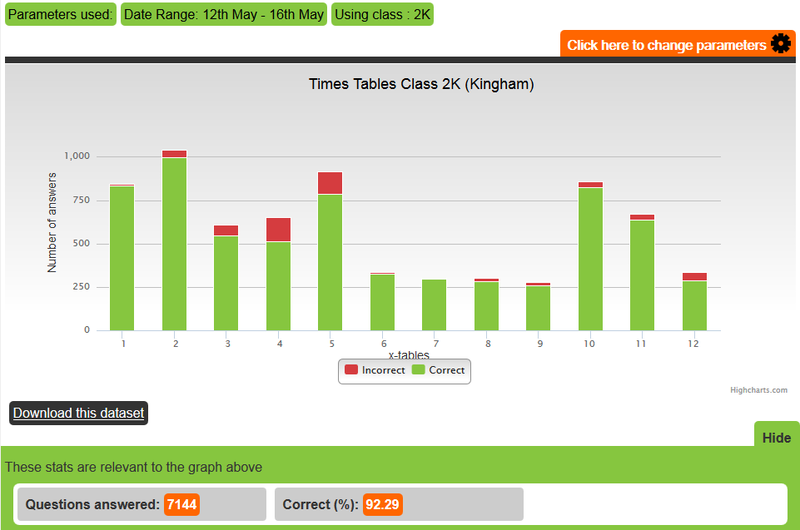 The data shows how many individual times table questions were answered by the class, playing daily for a period of approximately 15 minutes. 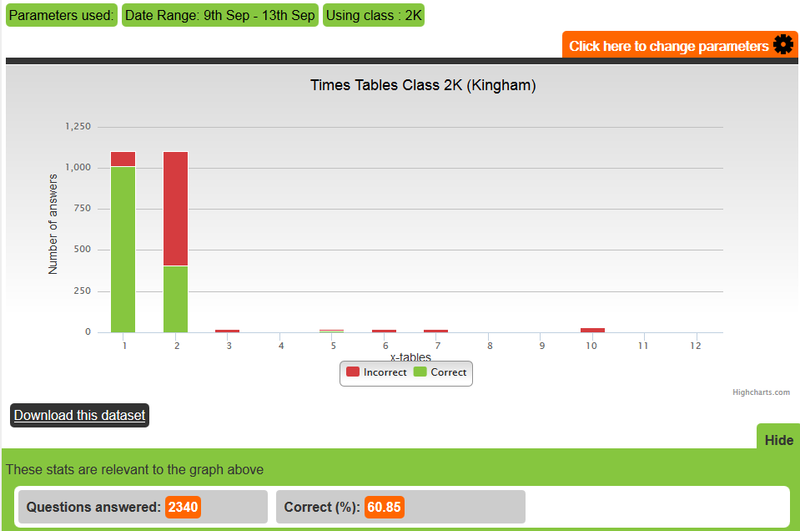 Graph 1 shows the first full week of school: 2340 questions, 61% correct almost all the 1s and 2s. Graph 2 shows a full week at the end of the Autumn term and here we see a dramatic improvement - 4088 questions answered, 88% correct and now 1s, 2s, 4s, 5s and 10s, with a smattering of the other times tables (the class had answered 51,000 questions by this point!). Graph 3 shows a full week in the middle of the summer term with 7144 questions answered, 92% correct and now a good number of 6s, 7s, 8s, 9s and 12s (170,000 questions answered by this point!!!!). Remember, the National Curriculum requires Year 2 children to know their 2s, 5s and 10 times tables. 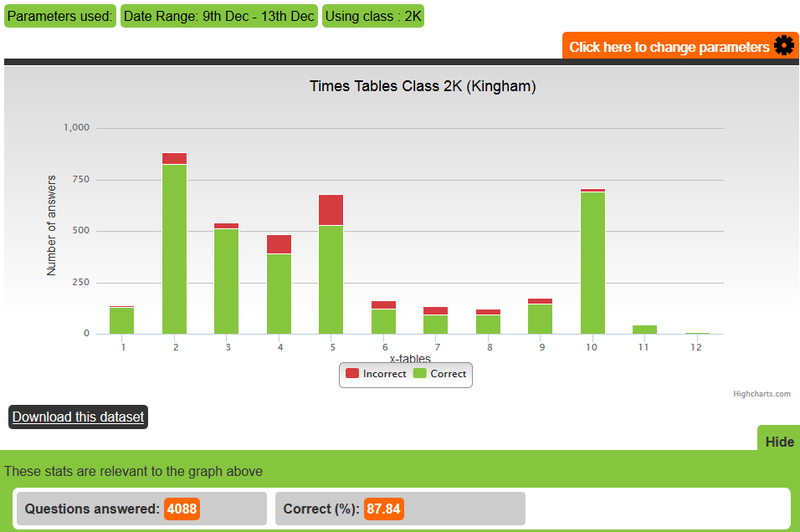 In terms of individual successes - 65% of the class now consistently know all their 1-12x tables. What does this show? IMPACT. The data clearly shows increased knowledge, increased accuracy and increased speed resulting in a dramatic increase in achievement and a massive boost in pupil confidence, which will provide the perfect springboard for future mathematical learning. All of this without any marking and with huge amounts of fun and enthusiasm. Fantastic!